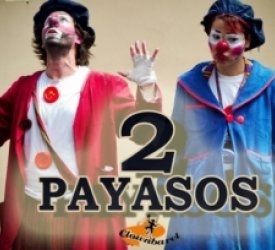 The performance company Clownbaret presents their classic clown show 'Two clowns', which will entertain children and adults alike with its originality and energy. The story is about Macarroni and Woody, two clowns who try and make each others lives impossible, interacting with the audience and making specators laugh. A fun show for any age, full of mischief and imagination.